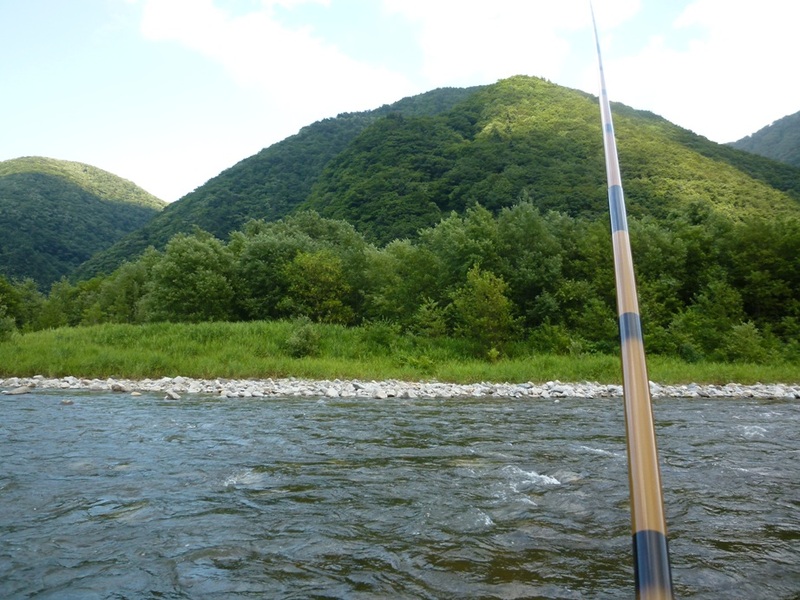 Akaishi River in Ajigasawa Town which has its source in Shirakami-sanchi, the world natural heritage site is well known as the “Kin-ayu(Golden Sweetfish)” fishing spot among enthusiastic anglers. 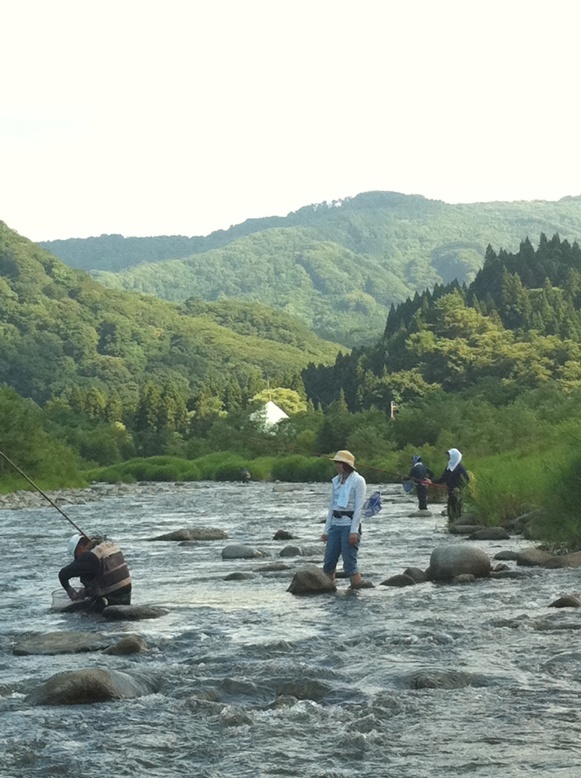 The opening day for Kin-ayu fishing season in Aomori is July 1th every year. 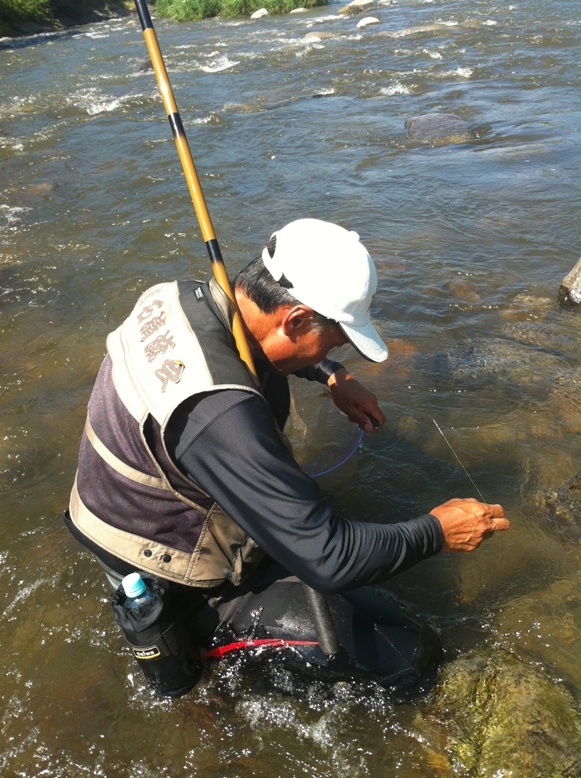 Hands-on Kin-ayu fishing experience in Akaishi River is available on Thursdays or Sundays between July 24th – August 31st. Three of my colleagues and I had enjoyed the experience last Thursday while our rest of the colleagues in the office were jealous about it (haha). 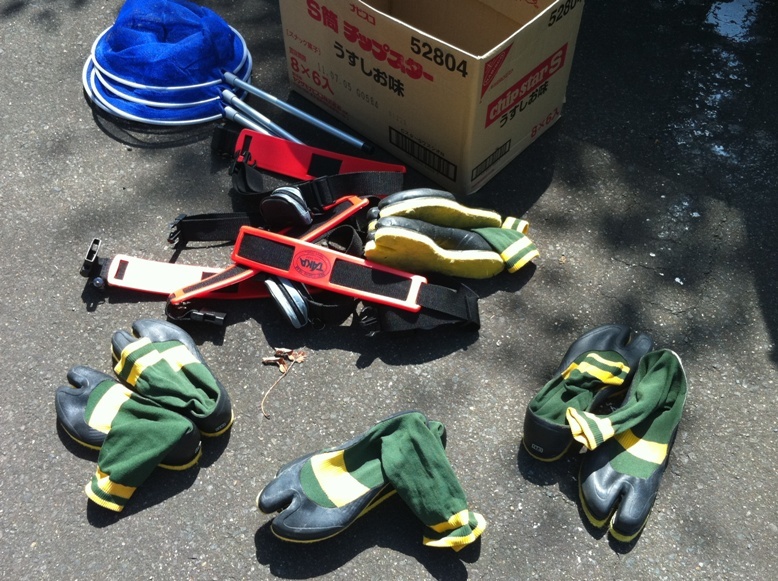 Fishing tackle can be rent such as nets, belts and….wait, are these wading shoes? 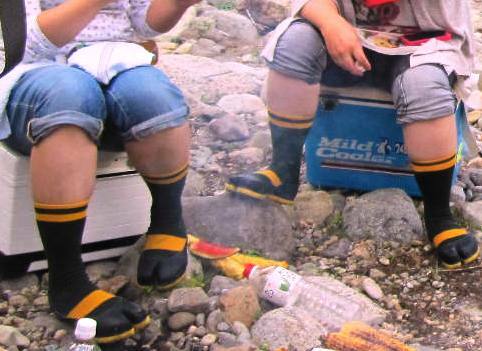 Even me, as Japanese, thought the shoes looked very…interesting. No we didn’t rent them from Ninja Turtles (They must live in NYC, at least not in Ajigasawa). Seriously, these wading shoes with felt soles were nice for safe travel in rocky streams. 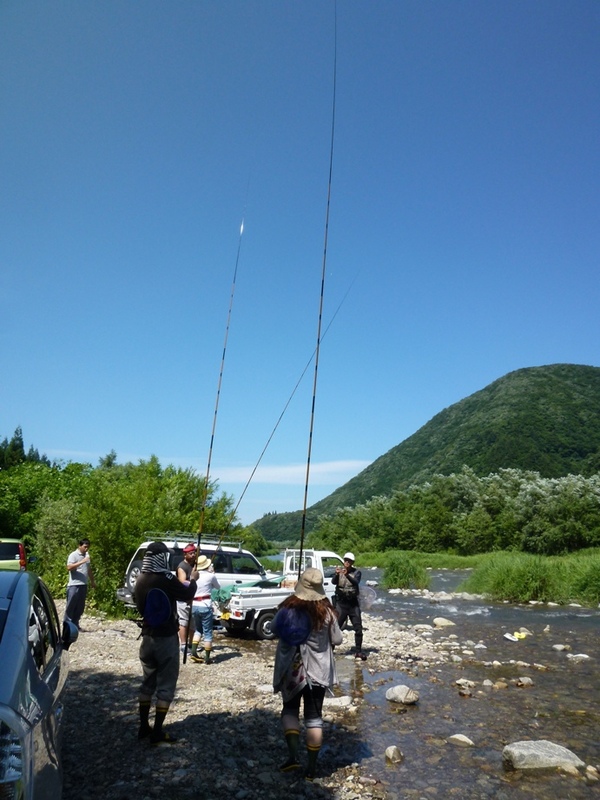 The fishing rods were 6-meter long, and the instructor told us that experts use 9-meter long…wow. Our instructor Mr. Saito did everything for us, putting a live bait on a hook, take the stuck hook off the rocks, taking off the hook from my catch, preparing BBQ and everything else. The kind fishing instructor is very dependable for beginners like us. The scenery reminded me of the movie “A River Runs Through It”. Kin-ayu are very territorial, and each fish tries to keep the territory of about 10 to 20 square meters. They attack any other fish that go into their territory. The trick is making use of their nature, and uses other kin-ayu as a bait and let kin-ayu attack the bait. 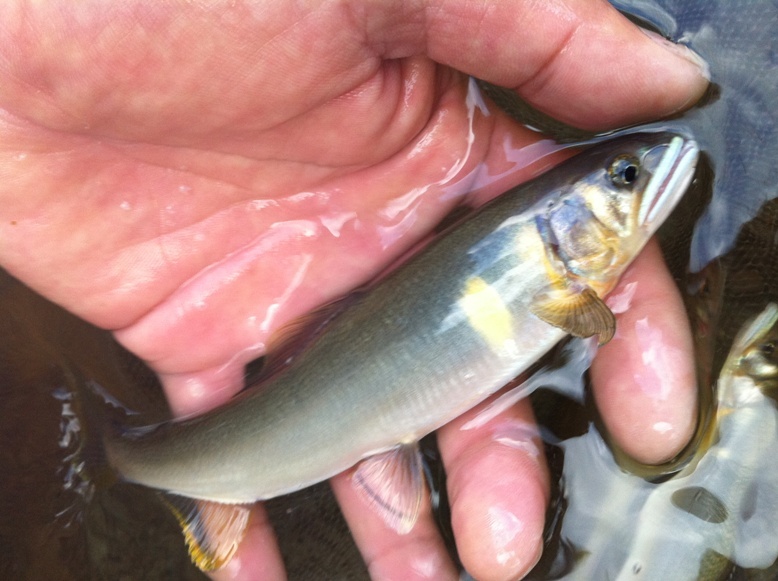 The tip of fishing with a live Kin-ayu bait is let the bait swim as natual as possible. 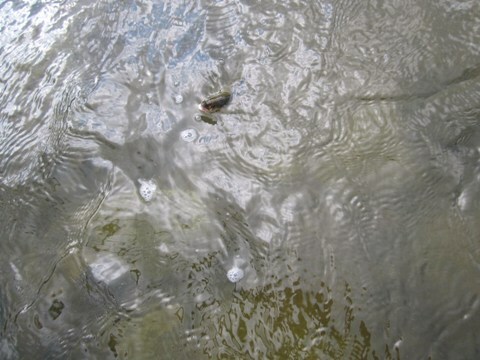 Beginngers tend to pull the live bait, and if you can see the nose of your bait above the water like this, it’s no good and sensitive fish will never be deceived. 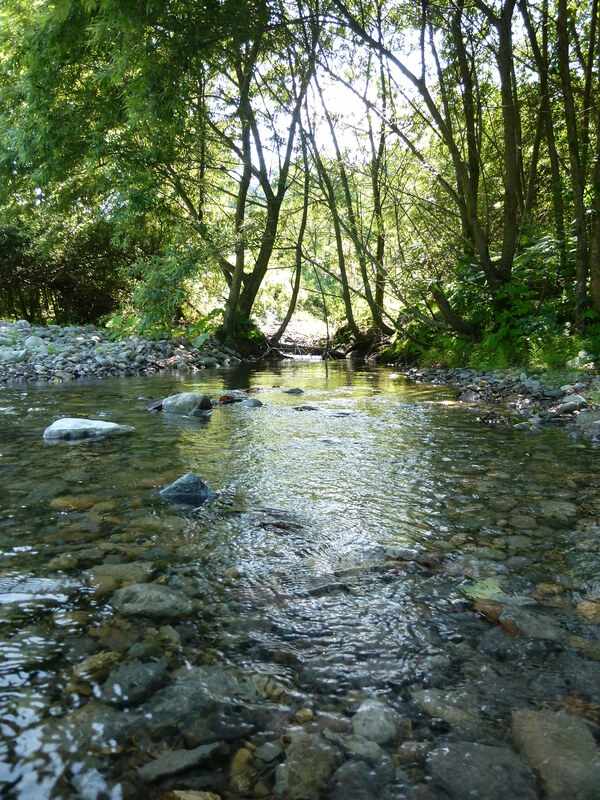 Holding the long fishing rod still and standing still in the stream for hours all by yourself was like some kind of training or meditation. Fising is never fun while not getting a single bite. I thought about the issues and problems of my life, what I should eat for dinner, why Japanese girls tend to treat foreign guys like stars, and remembered about the 3-year-old American boy who was having difficulty saying “s” sound, and when I asked him to say “SNAKE” he said “NAKE”…cute. When I’ve run out of things to think about, I got a bite! FINALLY……my first catch!!! Cowabunga! (Mind you, I’m not Ninja Turtle.) It took me more than 3 hours to experience this exciting moment. 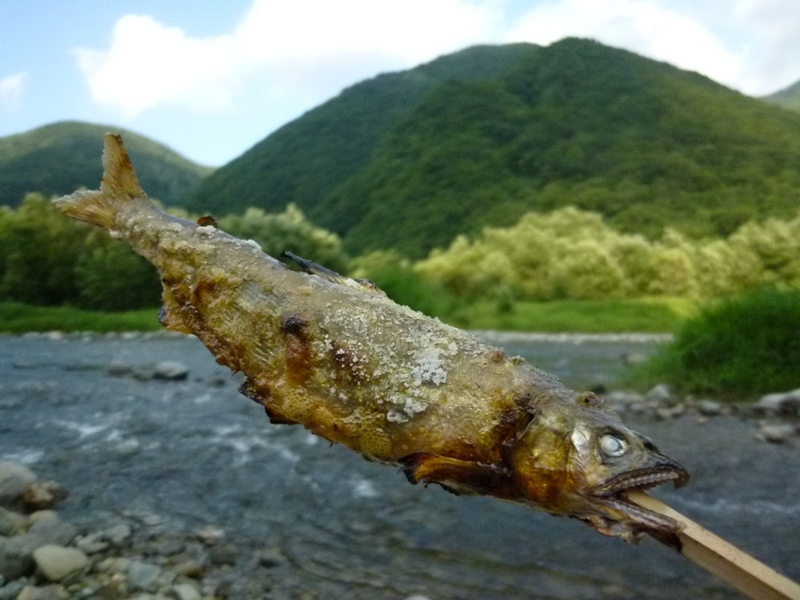 Freshly caught Kin-ayu BBQ can be enjoyed by the river (you can also take your catch home with you ). 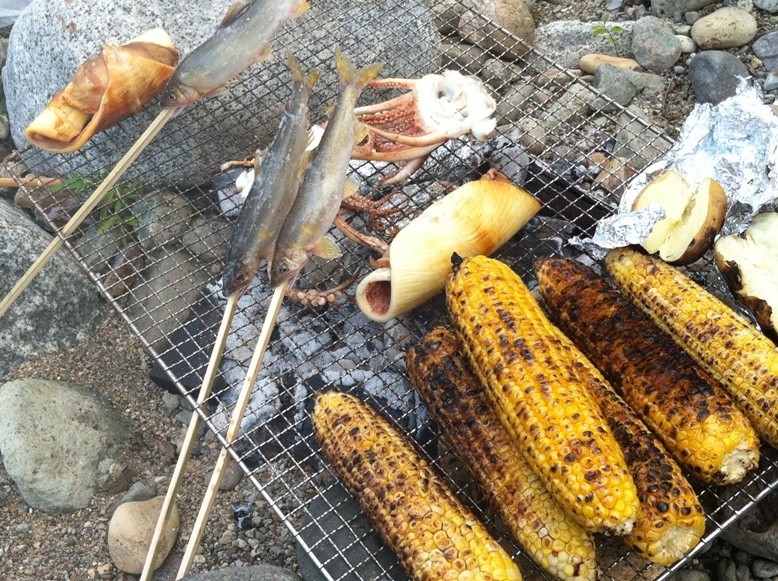 Did you know grilled corn with soy sauce taste soooo good? I said “Itadakimasu”. Itadakimasu is the Japanese set phrase said before eating, showing appreciation for people who cooked food, caught, raised ingredients as well as for foods giving us their lives. Catching fish by yourself and eating in the middle of nature was a great experience to think about the greatness of nature, and you are part of nature. 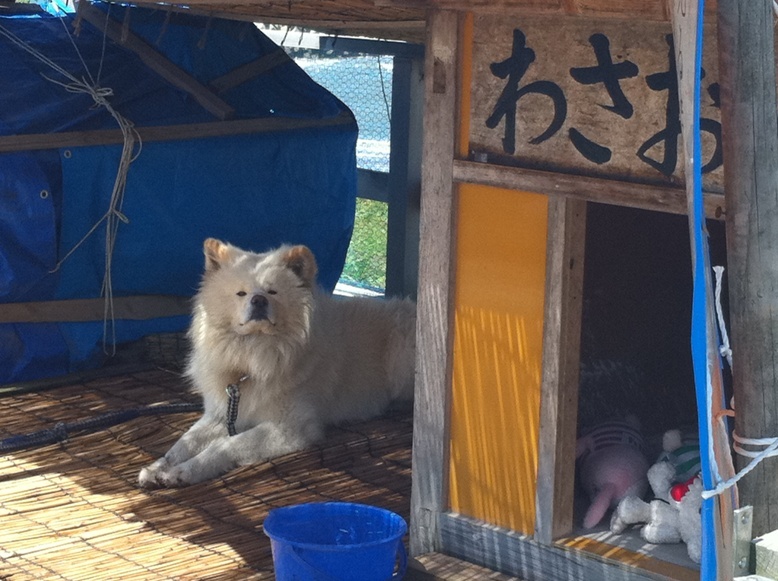 On the way back home, we swung by the house of the most famous dog in Aomori – “Wasao” is the movie star dog well known as the “ugly but cute” dog in Ajigasawa Town.